To put it plainly, every type of play that happens on the field either puts the offense closer or farther from scoring a goal. By looking at how often a type of play leads to a goal, we can quantify the expected value of each play. And by accumulating the value of each play made by each player, we can get to a total “value” created for each player. And once we have a total “value” number for each player, it’s very difficult to resist the urge to rank players. To date, we’ve done that on a week-to-week basis so that we can show who had the best individual performances. But that’s been at an individual game level. One thing that I realized early in that process is that it’s not quite fair to non-FOGOs to have everyone lumped together. And it’s beyond unfair to defensive players. FOGOs just have so many more measurable chances to impact their teams chances. It’s not that defensive players have less impact, it’s just that it’s difficult to measure their impact as directly. So the solution was to show four different “total value” lists. One for all players, and one each for the various classes of players (primarily offensive, primarily defensive, FOGO). The “all players” list will still give you the best sense of who has had the most value overall. The other lists reframe the ranking a bit; instead of most value we might say the “most valuable” defensive player. OK, so that is the concept. But we still needed an algorithmic way to classify each player. This is actually fairly simple, although you might disagree on the thresholds. First of all, we check to see whether 50% or more of a player’s value is related to winning face-offs. So even if a FOGO is getting a decent number of goals or assists, most of their value is going come from winning faceoffs. And if a FOGO is scoring so much that they qualify as an offensive player, that is fine; they will still be #1 in the overall player listing. If a player doesn’t qualify as a FOGO, then we check whether 30% of their value comes from defensive type plays, including caused turnovers and penalties. Again, a defensive player who is extremely active in transition might squeak into the offensive list, but again, since their total contribution is captured in the “all players” list, that’s ok. The intent here is just to try and get to a better apples-to-apples comparison. 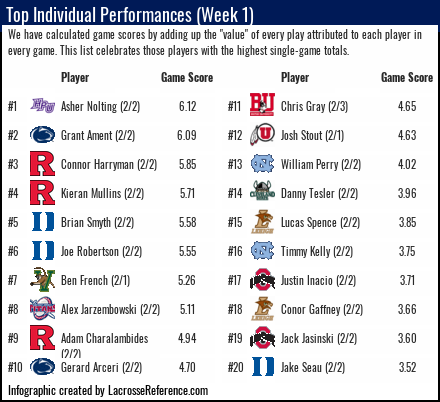 When we do our weekly rankings, the best FOGOs always show up. I wanted this to be a place where we publish a “value” ranking that accounts for the differing amount of chances various player types have to produce value.